Robin B. Shermis, MD, MPH, is the medical director of Toledo Hospital Breast Care Center, part of the ProMedica Health System. Sharing his 18 years of breast imaging experience, Shermis recently discussed current trends and issues in breast imaging with Radiology Today. 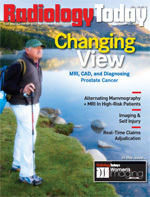 Radiology Today (RT): Women’s imaging was a big topic at RSNA 2008. What do you think is fueling the seeming boom in women’s imaging? Robin B. Shermis, MD, MPH: Women’s imaging has always had a high profile. Recently, though, so much progress has been made in our ability to detect breast cancer and our ability to have a significant impact on the improvement in the morbidity and mortality of the disease. That progress accelerated over the past few years with digital mammography, CAD [computer-aided detection], and breast MRI. Even ultrasounds have improved dramatically over the past few years. Researchers are also working on tomosynthesis and molecular breast imaging, although neither cancer detection method is available for widespread use. RT: How is this progress reflected in your market? Shermis: Advancements in breast imaging equipment give us more confidence in being able to detect breast disease when we read mammograms and perform ultrasounds. It’s a nice feeling that you’ve done everything you possibly could to detect disease. Before these advancements, it wasn’t so clear cut. Mammography, in its analog stages, was just OK. Ultrasound previously was just OK. But now, if we have any questions, we can move on to better ultrasound and MRI. I think everyone—the patient and the breast imager—feels better. Even today, with our better equipment, you can’t see everything, but now you have a real good shot. RT: There has been much media coverage lately about breast cancer. How does this notoriety affect your breast imaging practice? Shermis: When a high-profile star has breast cancer and she discusses how well it was diagnosed, sometimes that can be misleading to the public. The public just hears the success but often doesn’t understand the reality of breast cancer detection. But if publicizing breast cancer will encourage women to get their mammograms, then it’s a good thing. I don’t mind it when these big stars come out and discuss the challenges that they’re having. RT: How much of this breast cancer notoriety is clinically driven, and how much of it is a function of marketing or differentiating your facility in the marketplace? Shermis: It’s predominantly clinically driven, at least from the breast imager standpoint. We don’t do a whole lot of marketing for our breast care center. When people learn you’re doing a good job of diagnosing breast cancer and treating patients, that success spreads through word of mouth. If you’re absolutely committed to the process, then it will reflect in your clinical work. RT: Are all breast imaging technologies widely available? Shermis: With each new technology, there is a period of time where availability is a question. I spend a lot of time trying to facilitate the process. Once insurance companies fully understand what a new technology may be able to do, they will start covering it. This was certainly the case with breast MRI. For example, today, a woman with a diagnosis of breast cancer would undergo preoperative staging with breast MRI to show the true extent of the disease. That way, her surgeon would know how much tissue to remove during surgery. Without MRI, the surgeon would perform a lumpectomy and, if he or she finds positive margins, would then have to go back in and do another lumpectomy and sometimes a third lumpectomy. That’s very trying to the patient, and it’s very costly—one surgery pays for 12 MRIs. Once the surgeons and referring primary care physicians become educated in a new technology, then it becomes more available to the patient. It’s difficult sometimes to get the word out to referring physicians about exactly what you’re doing and how it can impact their patients. Women today are also not afraid to push the technology, but it must be used in the appropriate setting. Right now, we adhere to certain criteria, such as those supported by the American Cancer Society, when determining if breast MRI is the appropriate tool for detection of breast cancer in high-risk women. For women in the high-risk category (one primary relative with a history of premenopausal breast cancer or two primary relatives with postmenopausal breast cancer), we go out of our way to make MRI available, precertify them, and schedule them so that they have access to the equipment. If a woman has any combination of risk factors that place her at a 20% risk of developing breast cancer, we rarely have any problems qualifying for breast MRI. As new technology is used more and the referring clinicians and insurance companies get to know it better and know what it can do, then getting precertified becomes easier and easier. RT: How has breast imaging changed since you entered the field? Shermis: The big thing that’s changed during my 18 years in breast imaging is the minimally invasive approach to diagnosing breast cancer. I have seen the transition from surgical biopsies to needle biopsies directed by ultrasound or stereotactic biopsy. It’s extremely unusual now for us to see a surgical biopsy. Minimally invasive biopsy leads to much less deformity, it’s less costly, it’s all done in an outpatient setting, and it’s quicker. The other big thing has been the development of CAD in terms of improving the accuracy in reading mammograms. Also, the transition to digital imaging has been spectacular for us because we are getting much better pictures with built-in CAD, and you’re able to manipulate the images. Today, we also have better access to images. Images taken at imaging centers can be accessed by physicians at nonimaging practices. With our practice, images are taken all over the city, but they’re all funneled into the breast care center where breast imaging specialists read them. Another huge development in our practice has been dedicated breast MRI. We have the Aurora Dedicated Breast MRI in our breast care center. With breast MRI, we can see so much more. It’s just been fantastic. RT: How does breast MRI improve your ability to detect breast cancer? Shermis: When a patient undergoes breast MRI at our center, we can review the results with them right away. If we see something in the MRI, we can take the patient just a few yards for a second-look ultrasound. The different imaging technologies—mammogram, ultrasound, MRI, and biopsy room—are all next to one another. If we have to do a mammogram before or after the MRI, the woman doesn’t have to leave the facility. Having this dedicated breast MRI, which produces spectacular images, as part of our breast care center really streamlines a patient’s workup, and it’s all occurring in a much more natural setting. Patients feel more comfortable. It’s definitely a more intimate setting for their workup than at a hospital. RT: Would you consider the learning curve to new technology a stumbling block in its adoption by physicians? Shermis: When you’re confronted with a new technology, everyone’s a little uncomfortable. There’s a lot to learn sometimes with new technology. You don’t want to make mistakes using it. Then you spend time with it and learn from that experience. The more you use it, the better you feel. It can be a stumbling block for some people. However, most breast imagers are so committed to the process that they really want to learn the new technology because it will provide them with ammunition to see more cancers. RT: While breast MRI is generating a lot of buzz, what other developments do you see on the horizon that may be significant? Shermis: I see breast MRI getting better and better and becoming more specific. We’ll get better software to recognize certain lesions and whether or not they are suspicious. I’m excited about tomosynthesis, but I really don’t know where it will play a role in our practice yet. I don’t know if we’ll be using it as a screening tool or a diagnostic tool. I also don’t know enough yet about molecular breast imaging. I don’t use it at all, but I’m certainly interested in seeing what’s going on there and if we can bring it into our practice. There are only a handful of places using it now. Finally, image-guided treatment is an area that’s going to be big in the next several years. RT: What do you see as potential problems in breast imaging? Shermis: For a long period of time, a lot of radiologists wouldn’t go into breast imaging. In fact, it’s still hard to recruit people because of the high stress and the uncomfortable feeling that you might miss something. Recruitment is an issue that’s been overlooked. Although breast imaging is performed all over the world, there are not a lot of breast imagers. A lot of the fellowships for breast imaging go unfilled. That could be an issue down the road. A lot of times you have to convert someone who did not do a fellowship into a breast imager to support the growth in your practice. I’d like to see more people entering breast imaging, completing a fellowship, and getting a good foundation before going on to practice. Breast imaging is a stressful field. Even a woman who’s just undergoing a screening mammogram is extremely anxious and could be worried about the results. That stress can translate to the breast imager. This is also a very highly litigated area of medicine, so people are afraid of being sued. One of the specific areas of many lawsuits revolves around the perception that something was missed during breast imaging, specifically mammography. RT: With all the stress, why are you in this field? Shermis: Breast cancer is a common cancer, and it’s one that we can really attack to minimize mortality and morbidity in women. I feel like we’re really making an impact in someone’s life. I think I have a talent and the desire to really help make this work.